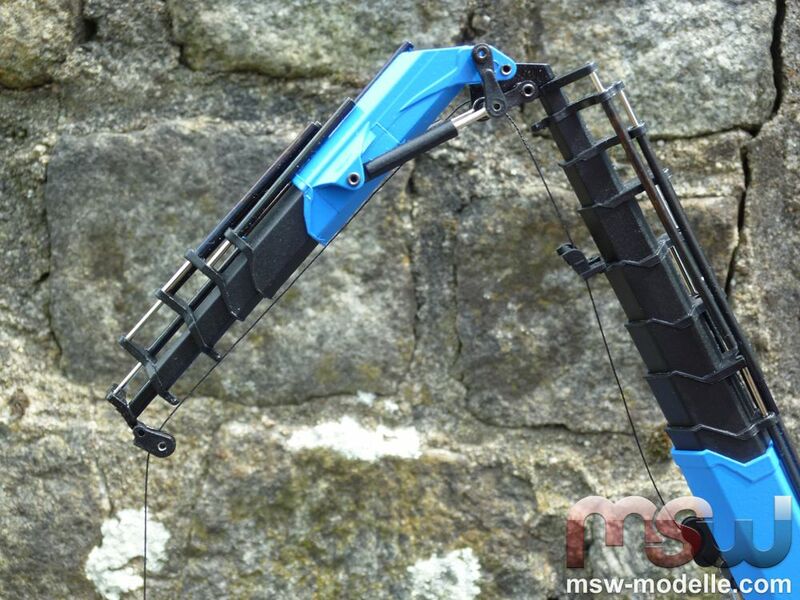 After the existing Palfinger crane PK53002 being already established as a die cast model, Conrad now adds a new version of the larger PK100002: with an additional fly jib. Also this version comes with great details and high functionality. 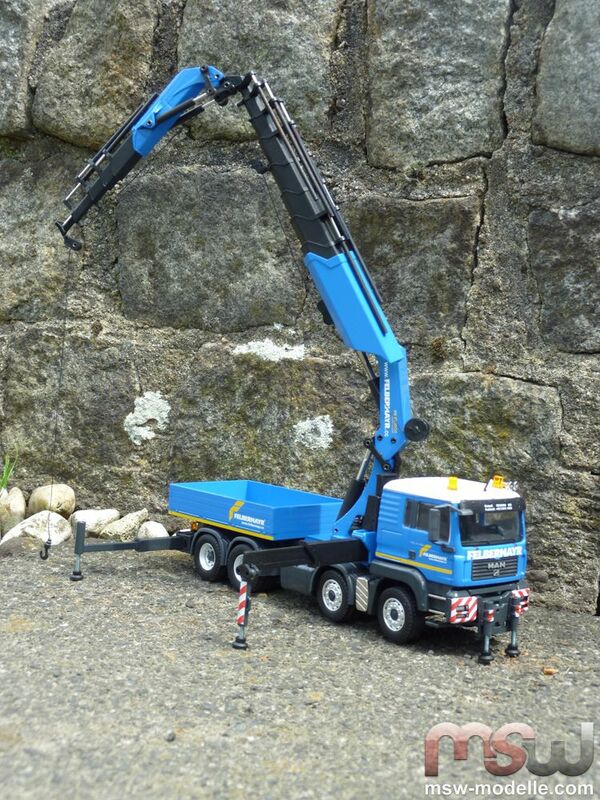 And with the famous blue colors of the Austrian crane company Felbermayr, Conrad chose a nice color well fitting to the already existing model range of the Austrian company, as for e.g. the huge LG1750. All in all, the PK100002 is a fantastic and amazing model with many details and manufactured by the proven and massive quality, "Made in Germany" by Conrad. 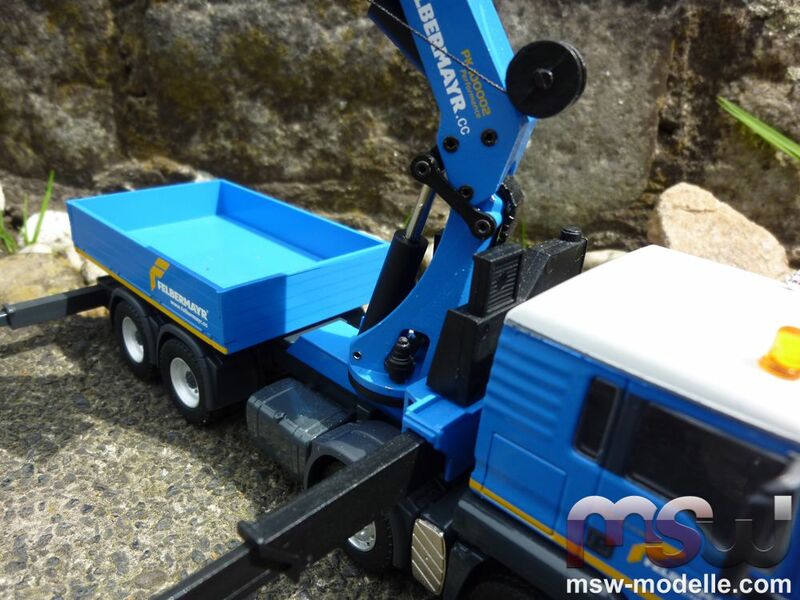 By the way, MSW Modelle also offers a range of additional accessories perfectly fitting to the model. 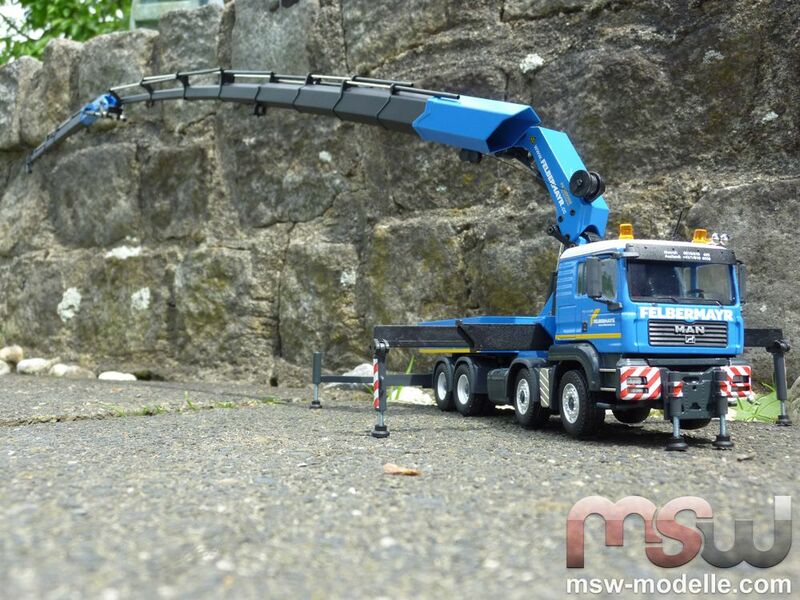 The massive 4-axle MAN TGA 41 480 is the carrier for this crane with a maximum lifting capacity of 30 t. Both front axles feature a huge steering angle providing a tight turning circle. 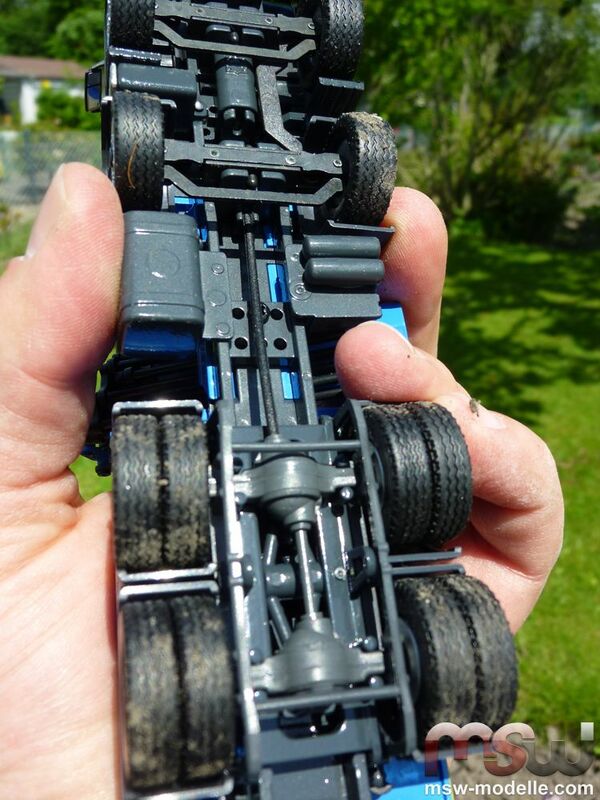 Both rear axles are oscillating and therefore provide a great ground contact. This is required when travelling in rough areas. In total 6 outriggers provide stability to the truck. In addition to the 4 sideways outriggers additional 2 are located in front of the cab. With exception of the last section of the back outrigger all are made of plastic. During travel the front outriggers are positioned upright. 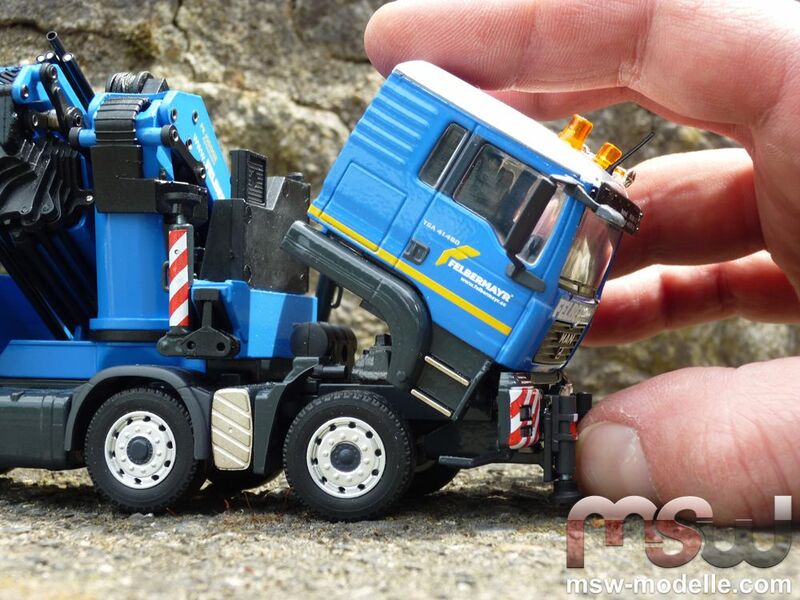 If the crane is not at work, it is folded behind the cab in a very compact way. 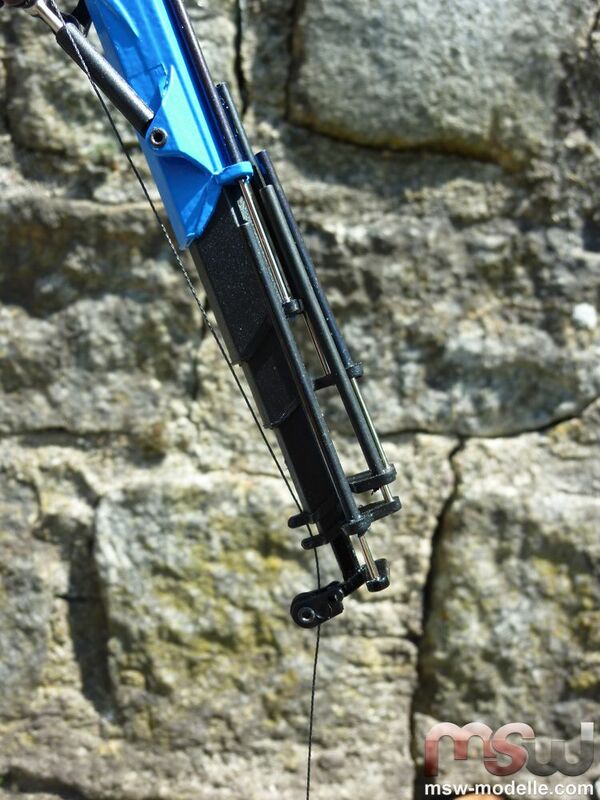 The fly-jib is always assembled and does not need to be transported separately. When it is unfolded, the amazing crane is a real eye-catcher. The massive main boom has 9 sections, which are all made of plastic. 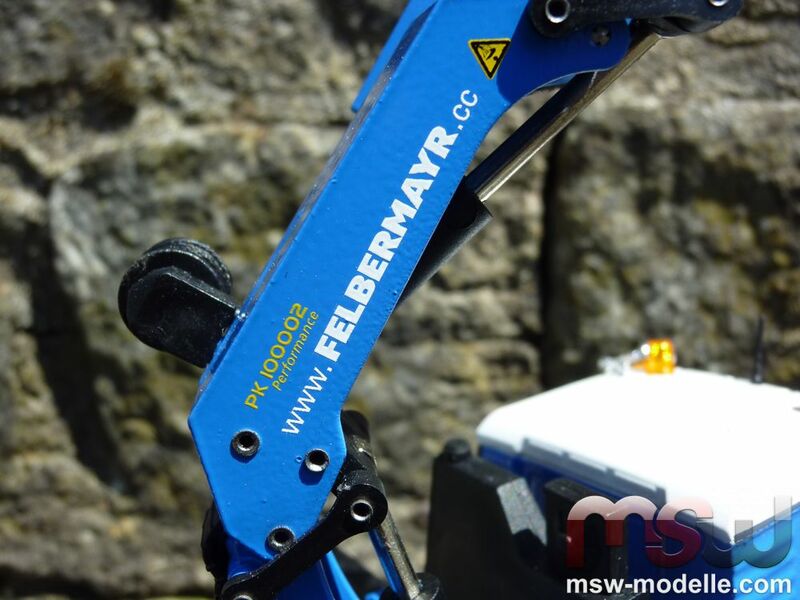 The additional hydraulic cylinders are very well copied by using zinc and a black metal pipe. The additional fly-jib is assembled by small rivets with the last main boom section – this one is the only one made of zinc. So a disassembly of the fly-jib is not possible. 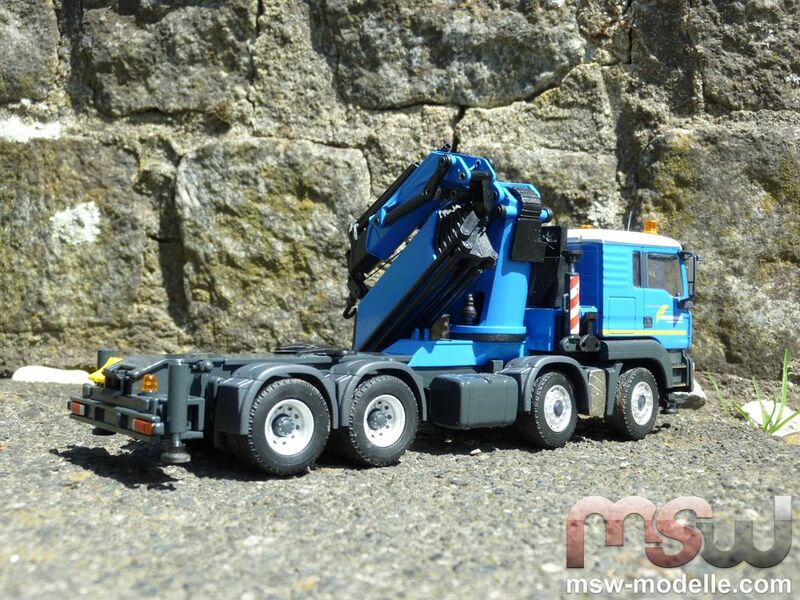 Also here the boom sections are made of plastic; small hydraulic cylinders do exist as well. 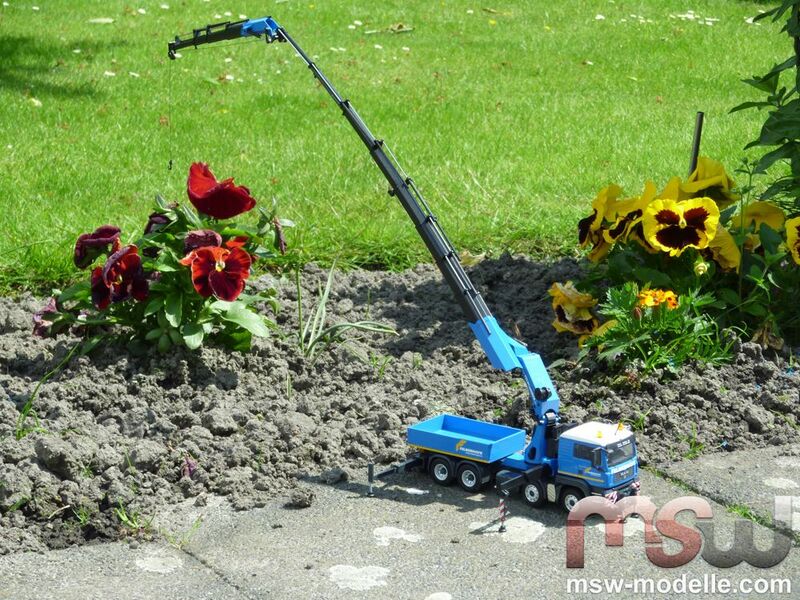 With the additional 5 sections the fully extended boom comes to a maximum sheave height of 74 cm or 38m in reality. The sheave with the hook is connected with the last boom section. 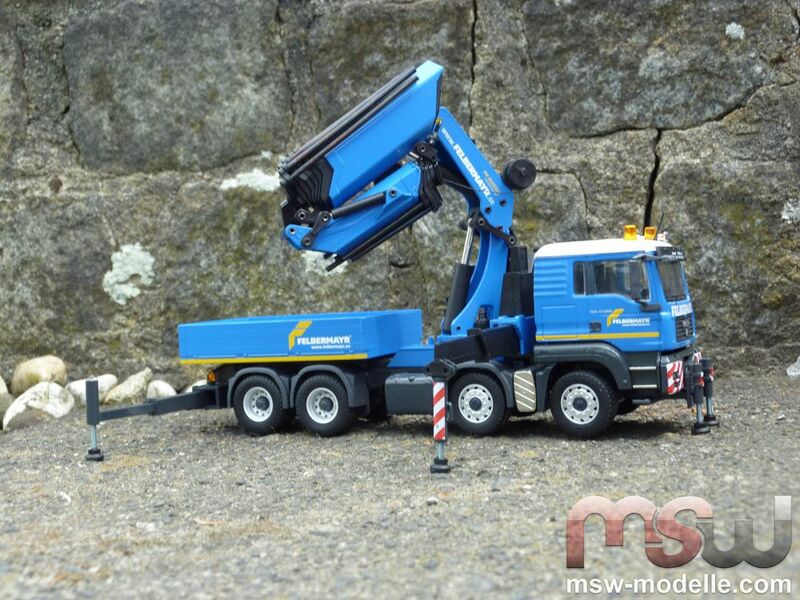 Alternatively you can also display the crane with a rotating hook without the winch. Two small sheaves located on the second boom section guide the line, especially when the crane is folded during travelling. All sheaves on the crane are also impressive since Conrad discontinued the plastic sheaves and treated the crane with real metal sheaves, which are also easily moving. Massive hydraulic cylinders are stiff enough to hold the boom in every position. Compared to the smaller brother PK53002 model, the cylinders on the PK100002 are now much more stiff. Hydraulic tank, cooler and slewing motors are copied well and easily recognizable. 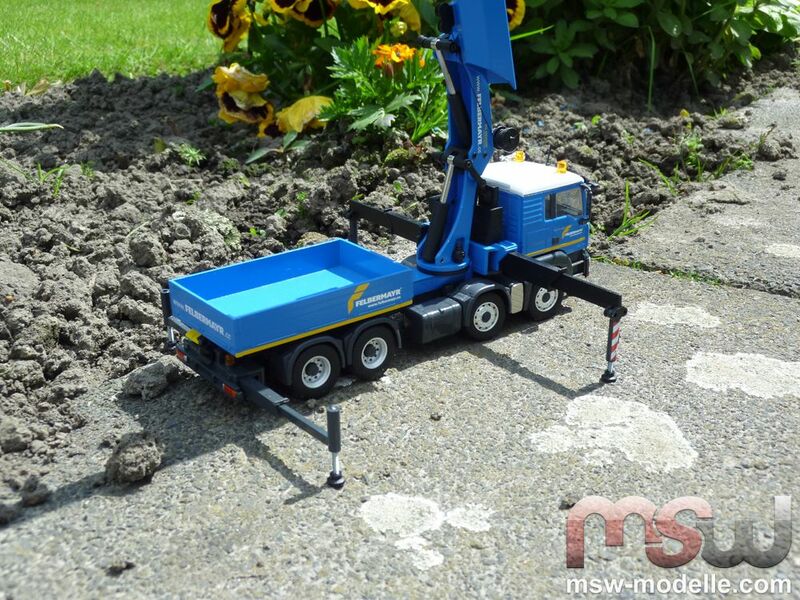 The truck can be used also in combination with a ballast trailer, since the loading bridge can be easily removed. 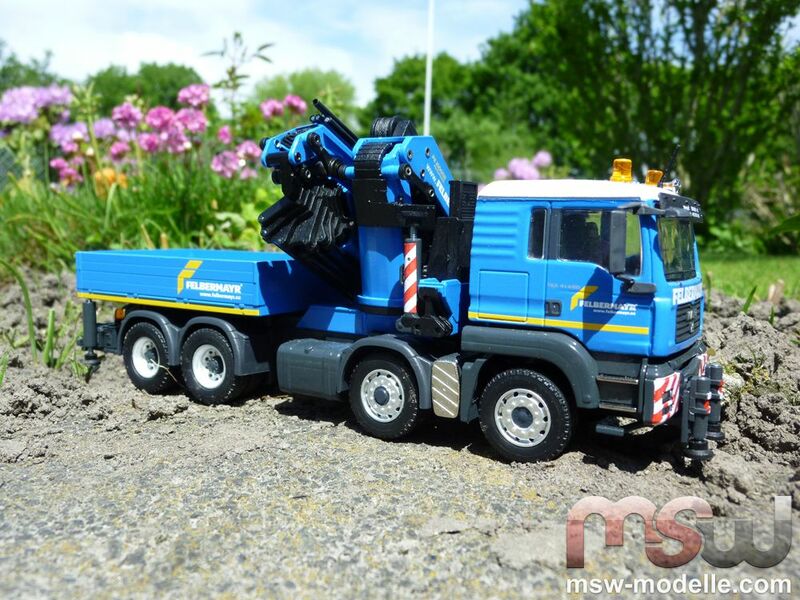 Also the typical decals are well done with the web address, warning signs and crane type. 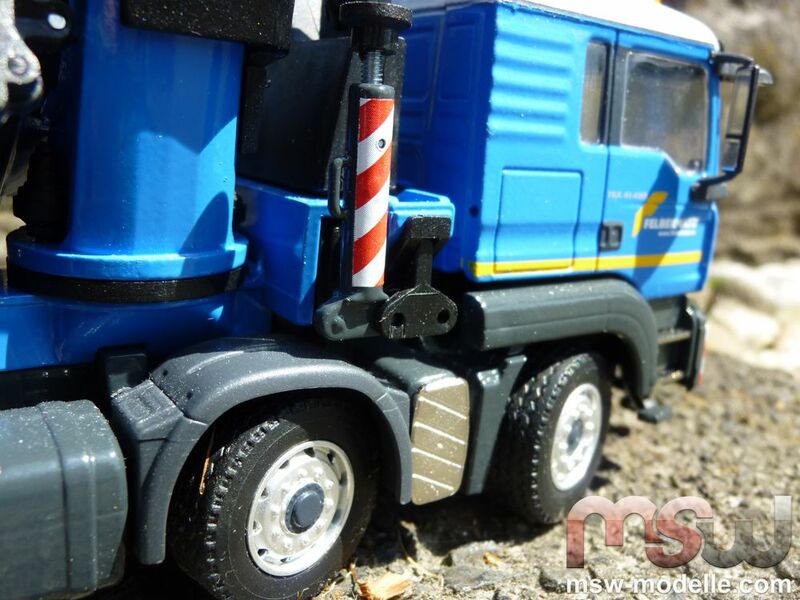 All decals are printed to the model. The hoist winch is located on the boom’s upside and provides enough line to fully lower the hook to the ground. 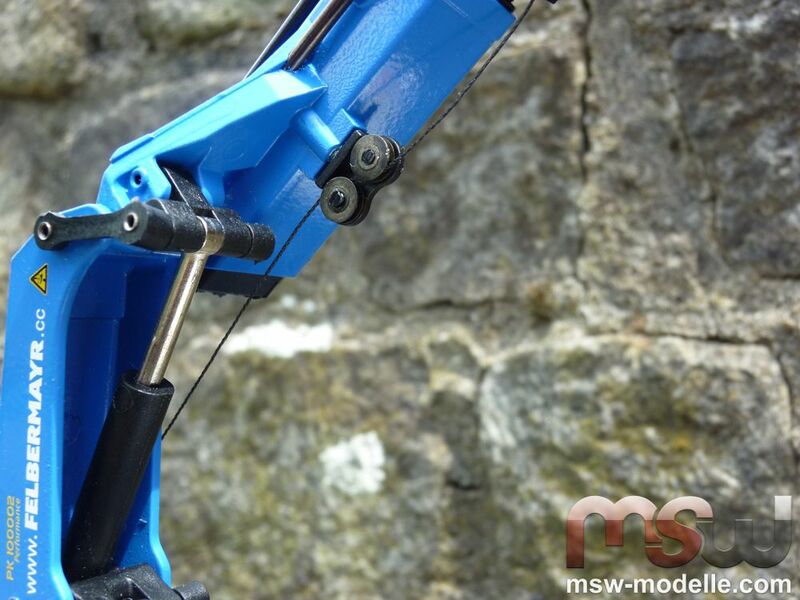 The maximum reach of the PK100002 including fly-jib is incredible 66 cm. Also in this position the cylinders are stiff enough to keep each position of the boom. The massive crane boom folds itself into the travelling position. Operating in reality typically is done by a remote control. The operator’s cab can be tilted; underneath you can see the copy of the engine. A small antenna is placed in between the rooftop beacon lights. *Carsten Bengs is the author of O & K Chronicles "Orenstein & Koppel - 125 machines, locomotives and tractors." 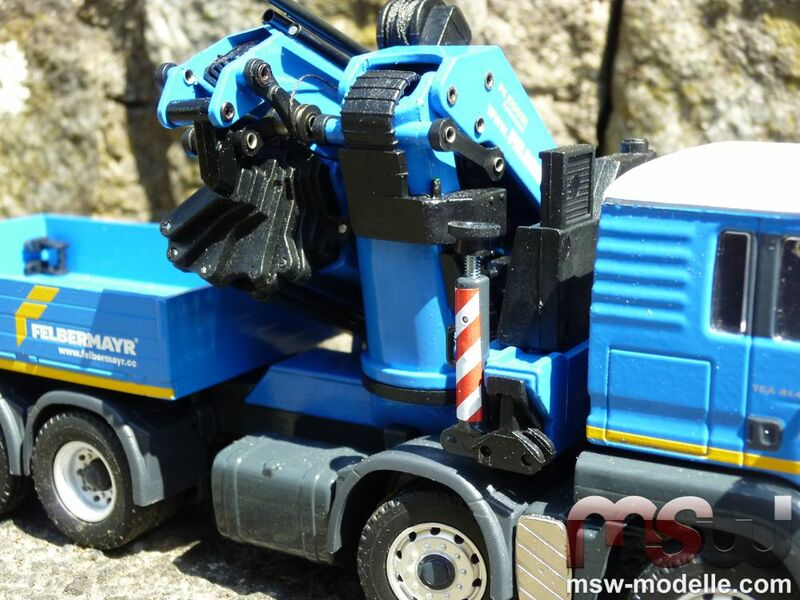 As a freelance editor, he regularly reports on construction equipment models in the magazines ToyTrucker & Contractor (United States) and truck model (D).